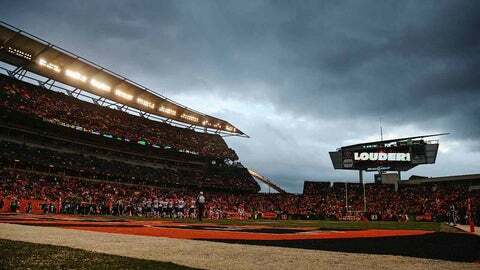 Cincinnati, OH, USA; A general view of Paul Brown Stadium during the game between the Cincinnati Bengals and Cleveland Browns. The Cincinnati Bengals announced Tuesday afternoon that single-game tickets for their first 2013 home playoff game have gone on sale. While the Bengals could still finish as high as the No. 2 seed and receive a first-round bye, they are assured of at least one home game this postseason thanks to their status as AFC North champions. That contest could come the first or second weekend in January, however, depending on the results of Week 17 affect the final playoff picture. Tickets also remain available for the regular season finale against Baltimore Sunday at Paul Brown Stadium, where the Bengals are 7-0 this season. Fans may purchase tickets through Ticketmaster online or by phone at 800-745-3000. Tickets are also available for purchase at Paul Brown Stadium or through the Bengals ticket hotline at 513-621-8383 (TDTD), though neither will be open Wednesday because it is Christmas Day. For all of the possible playoff scenarios in the AFC, check out Zac Jackson’s story from yesterday.